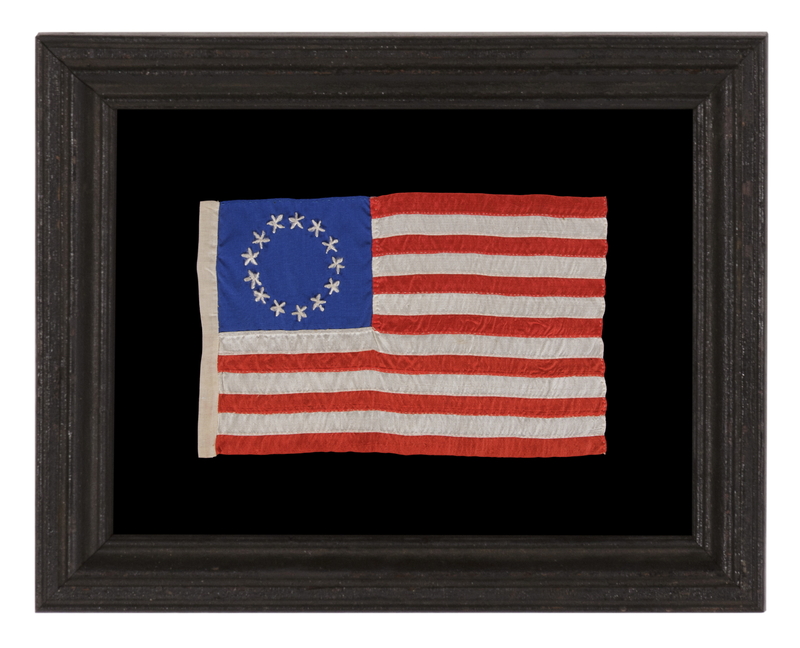 Frame Size (H x L): 13.25" x 16.75"
Flag Size (H x L): 5.5" x 9"
13 star American national flag, entirely hand-sewn by Rachel Albright or Sarah M. Wilson, the granddaughter and great-granddaughter of Betsy Ross. The stripes are constructed of silk ribbon carefully pieced with tiny stitches and a degree of precision seldom seen on American textiles. 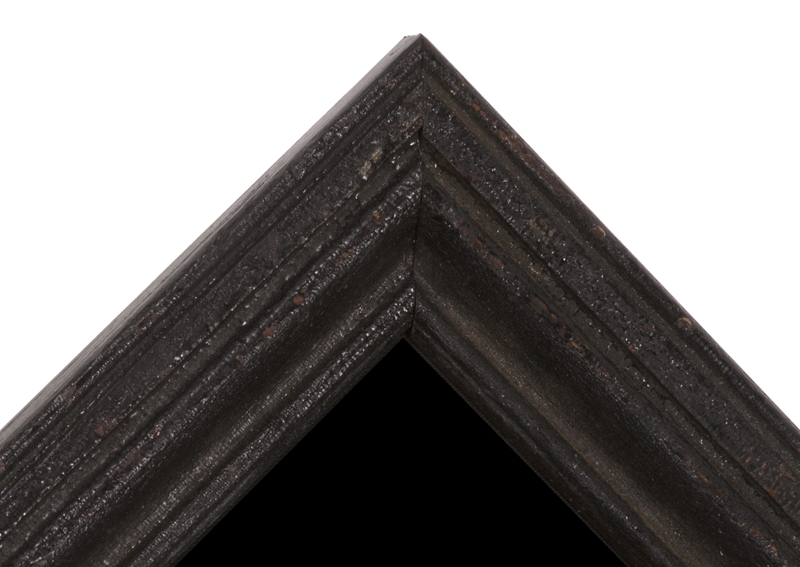 The five-pointed stars are executed with lineal lines like a spokes on a carriage wheel or the rowel of a spur. 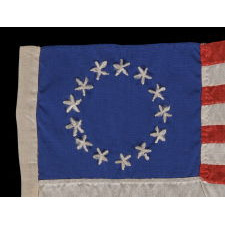 These are sewn with silk floss on a canton made of blue silk taffeta. An open sleeve, made of plain weave cotton, binds the hoist, through which a wooden staff could be inserted if desired. Rachel was born in Betsy's house in Phildelphia in 1812. 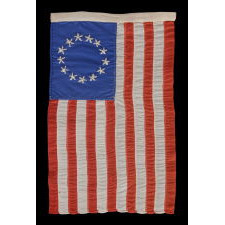 Her mother, Clarissa, was assisting Betsy with her flag-making and upholstery business at the time and would eventually inherit it. 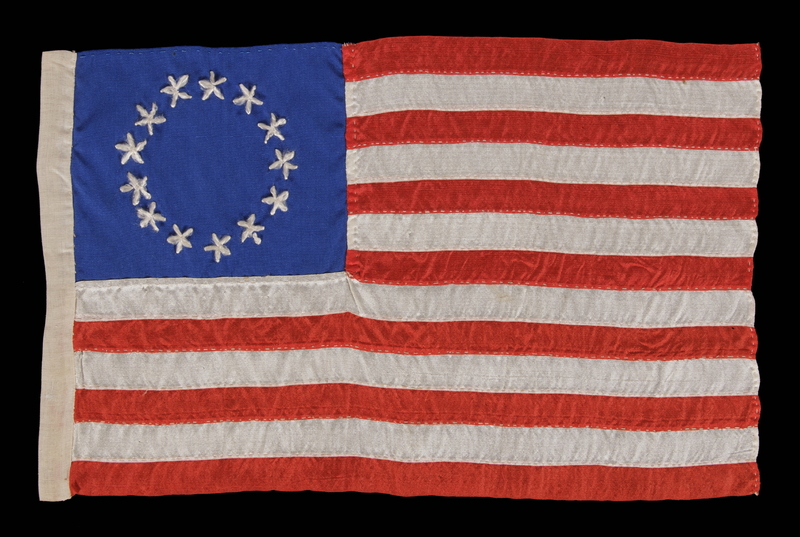 Raised by her mother and grandmother, Rachel relates how she was "cradled among the Flags made for the United States shipping at the Navy Yard" during the war of 1812, then underway, and how she "learned her first letters, at [Betsy's] knee. "* Rachel would eventually be taught the trade by her mother, who would, in turn, pass her knowledge of the craft on to Sarah. 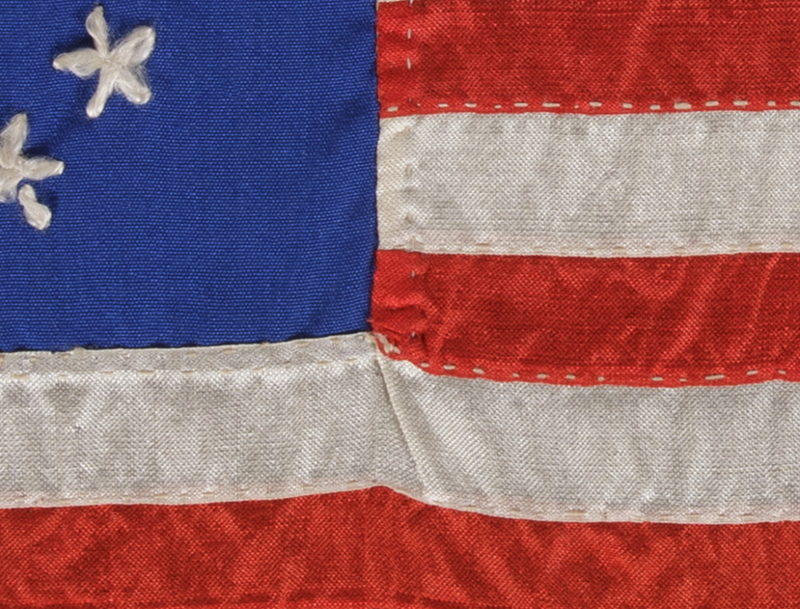 The Albright and Wilson flags are extraordinary because of their tiny size and silk, hand-sewn construction. They are easy to identify because their characteristics are so distinctive. 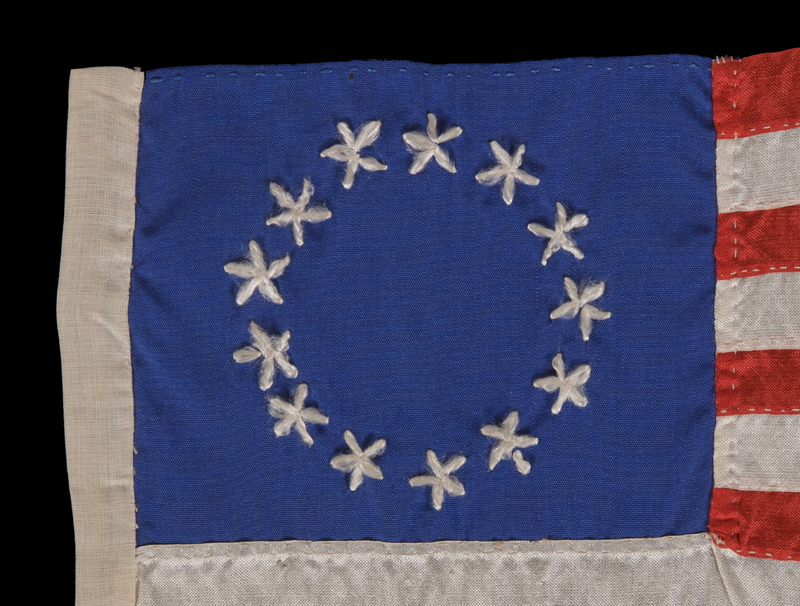 There is nothing else like them among 13 star flags made during this period. That having been said, they were individually made and do exhibit a small degree of personalized variation. The sleeves or hoist bindings vary in width and some have tiny, hand-sewn grommets. 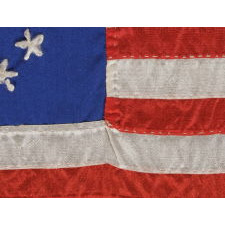 These flags typically either came with a separate note or a direct signature. This one has neither, but its condition and colors are exceptional. 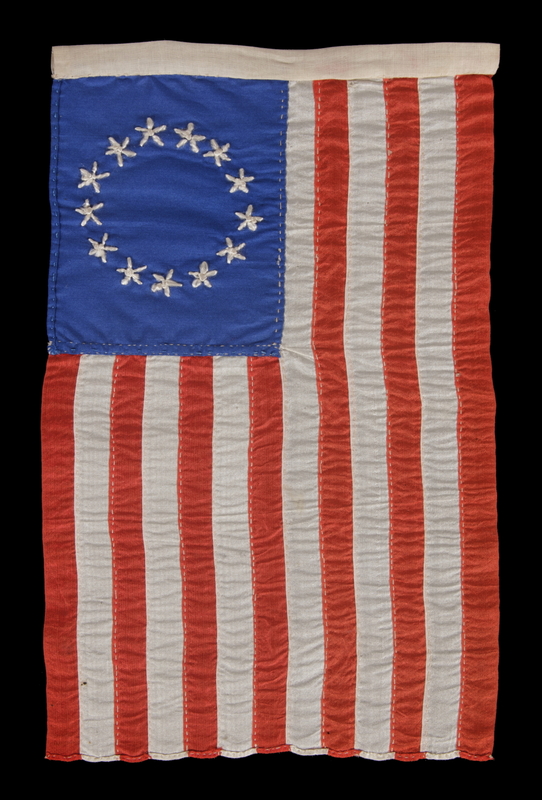 * Source: A hand-written account of the Ross story, owned by Jeff R. Bridgman Antiques, Inc., penned in 1903, entitled "A sketch of Betsy Ross, who made the first Flag of our nation. 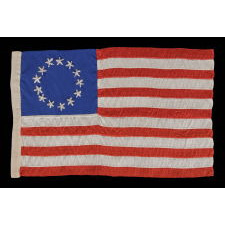 June 14th 1777. 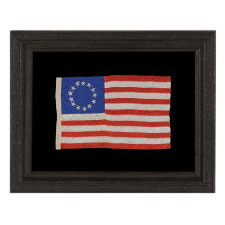 And also of her Grand-daughter Rachel Albright, who made copies of the original Flag, and has them for sale." Signed "Rachel Albright. Signed with permission." Probably penned by Sarah Wilson. 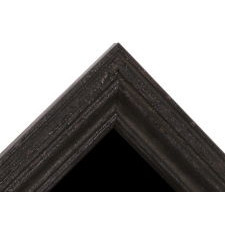 The exceptional, black-painted, American molding is very early and may date to the 18th century. We modified this by extending the back to accommodate the mount. The glazing is U.V. protective acrylic. Feel free to contact us for more details.